Whenever you are looking for an ideal web development company, what all things you require at that time? Easy code, simple to use features, or a scalable software? We consider all these things and a lot more apart from these. Isn't it? And when we talk about the customer's requirements in the e-commerce sector, it seems simple. Customers simply need to visit your website, select some items, add to their cart, make the payment, complete the order, and leave. That's it. But this process is not as simple as it seems to be. How Ruby on Rails Development Services Can Impact the E-commerce Sector? The technology which you'll use in your e-commerce development will define the website's performance, stability, and finally the customer outputs. Suppose, if your website has slow loading pages, or the payment page is sometimes not available, then do you think the customers will turn around to your website? Of course not! You need to choose a suitable and perfect technology like Ruby On Rails for your website development and offer accurate results on the customer's end and thus popularize your brand name. Wondering what all other advantages does RoR can offer to the e-commerce industry? 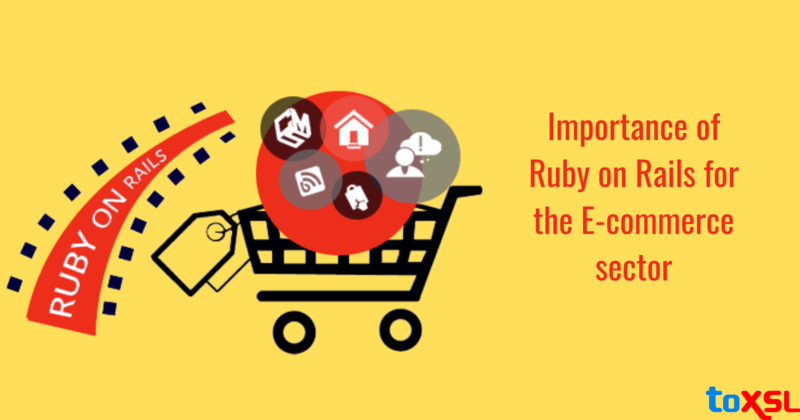 Here are the top benefits which Ruby On Rails can offer to the e-commerce sector. Project Cost Can Be Lowered: If you are spending more time on the development part, this directly indicates more costs. If you focus more on shortening the development process, it will be beneficial for both, the developers as well as for the customers. Ruby on Rails is easy to understand paradigms which simply reduces the development time. Smooth Integration Into Database: One of the top reasons which make RoR a more unique choice is its simple and easy integration with all your databases. The RoR framework reduces the need to write the code and thereby focus on the development part instead. Free Plugins: RoR platform comes up with plenty of available free plugins which makes it the best option for the startup businesses to begin their organization. This allows them to customize the entire website quickly without any delays. Enhanced Flexibility: In order to keep your website updated with the latest trends and technologies practiced in the industry, it becomes necessary to scale up your store and keep on implementing new features with time. Stability and Performance: Remember, if your website has a good loading speed and performance, customers will surely make purchases from your website and will definitely turn out as your loyal customers. Implementing RoR assures you better performance, speed, and reliability for all kind of websites. Payment Integration Made Easy: This is quite obvious that you need to offer multiple payment gateways over your website, whether it is the most used gateway or a least used one. So, you must look up for a framework which is easy to integrate with all kind of payment gateways without any hassle. Developing a website or a mobile application is a complex process which demands a lot of attention, efforts, and hard work of your team, but if you choose the right Ruby on Rails development company, your half work is already done. You can seamlessly attain the desired targets and satisfy the customers within your budget. Want to know more? Feel free to get in touch and get assistance from our experts.